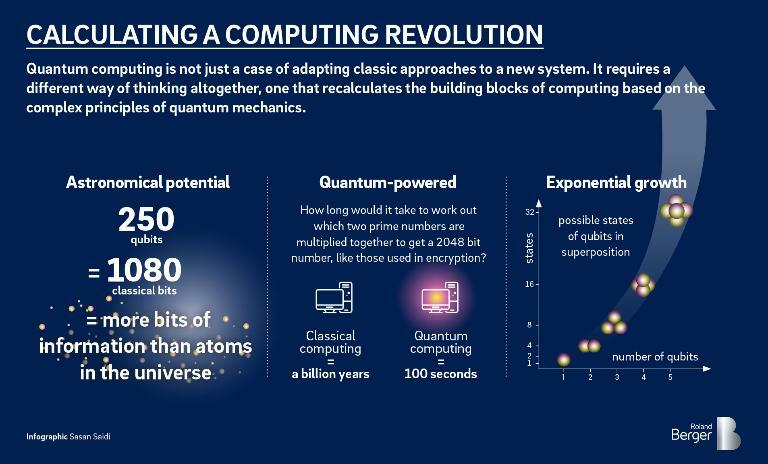 With IT giants, governments and startups all investing in quantum technology, are we standing at the dawn of the next computer revolution? Close to absolute zero, like being in outer space: That's how cold it is inside the cylinder, a dark vacuum that holds the information units that form the building blocks of quantum computing: qubits. If that sounds like the future, that's because it is. This new breed of computers will open up possibilities that are beyond our grasp today. Quantum computing is based on the peculiar principles of quantum mechanics, which not only allow a particle to exist simultaneously in two states at once – known as "superposition" – but also for two particles at a distance to instantaneously influence each other – known as "entanglement." Einstein may have described the idea as "spooky," but these principles are now being exploited to take computing to the next level. According to Anthony Annunziata, the associate director of IBM Q, quantum computers harness laws of nature that are always there but usually remain hidden from view. "By doing so, they are able to process information more holistically," he says. IBM Q is a network of companies, startups and academic institutions with a shared mission to bring quantum out of the lab and into the world. Over the past few years, scientists have succeeded in building and running ever more powerful machines to create and manipulate qubits. The machines may still look like sci-fi fantasy, but with IBM, Microsoft, Intel, Google, Alibaba, Baidu and others pouring billions of dollars into research to develop robust systems with real-life applications, they are on their way to becoming part of a present-day, commercial reality. A scalable platform: A microtrap makes use of electromagnetic fields to keep charged atomic particles in a confined space. 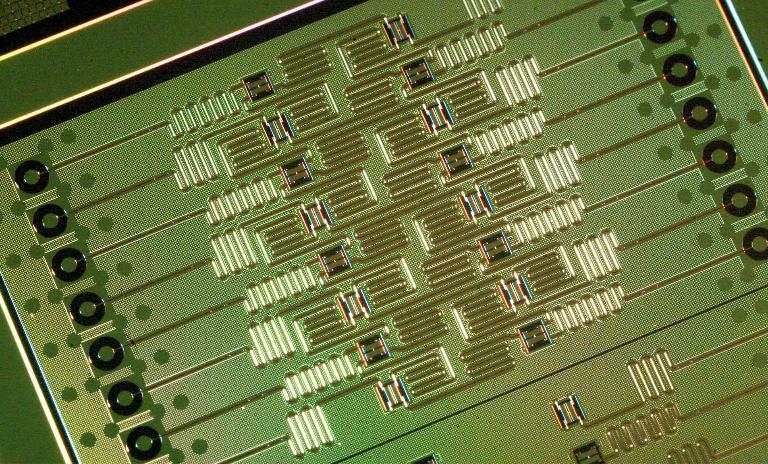 The qubits they store can then be manipulated by lasers. 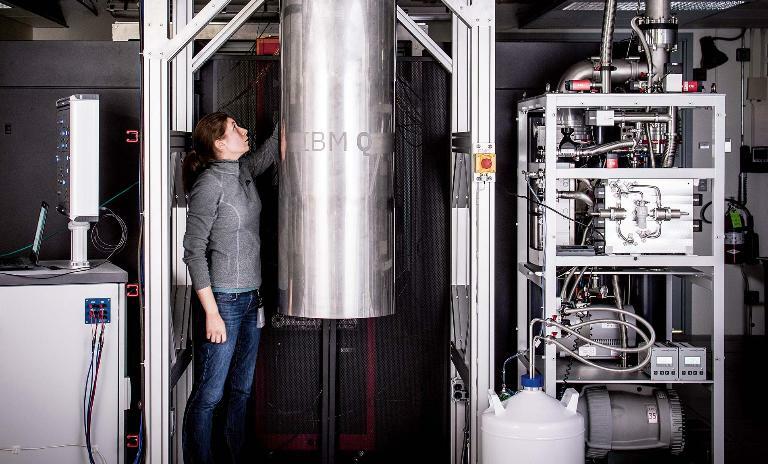 Reaching the real world: IBM Q team member Katie Pooley examines a cryostat containing a new prototype for a commercial quantum processor. Open for testing: IBM made its 16 qubit processor available at no cost over the IBM Cloud in May 2017. 1.5 million quantum experiments have been run so far by students, researchers and enthusiasts. The cause of current excitement is the potential of quantum computers to become more powerful than established computers for the first time. The advent of such computing power could lead to being able to complete highly complicated calculations that were previously impossible. The new breed of computers is able to do this by using superposition and entanglement to achieve exponential power: If one qubit can be in two states, two qubits can be in up to four states, three qubits in eight states and so on. By the time you reach 250 interacting qubits, this would provide the equivalent computing power of 1080 classical bits – that's more atoms than there are in the universe. These mindboggling numbers show the potential power involved. Progress in recent years has been rapid – we have moved on from machines with five qubits to 20, 50 and, most recently, Google announced a general-purpose machine with 72 qubits. 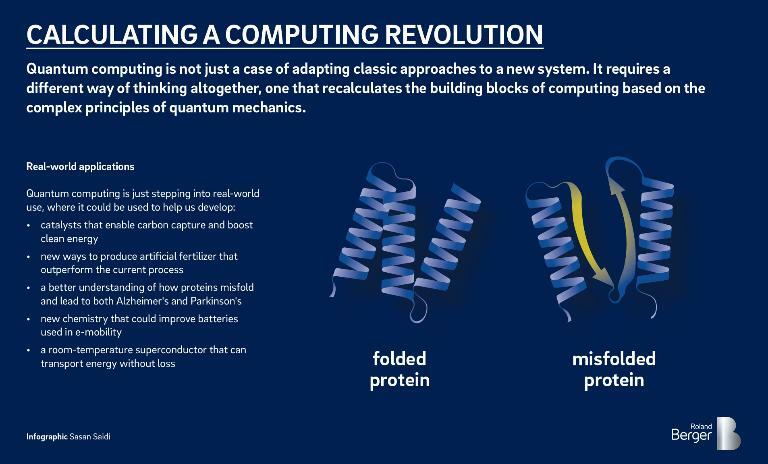 "For many years quantum computing was just an academic exercise – many even doubted it would ever work." The motivation driving this progress is that there are some kinds of problems that classical computers, no matter how large, cannot solve or would take far too long to solve. For example, how many different ways can you seat 10 people around a table? When you realize that there are 3.6 million possibilities for just 10 people and that the number of possibilities grows exponentially as more people are added, you see the challenge. Any problem with many different possible combinations of outcomes is well-suited to quantum computing. Industries ranging from logistics to pharmaceuticals, finance and energy supply face these kinds of problem. Because qubits can be in multiple states simultaneously, they can be used to check multiple options at the same time. Classical computers have to do the job sequentially, often taking far too long to be of practical use. With Moore's Law – the prediction that computers will become smaller and faster over time – beginning to run out of steam, the hope is that quantum systems can step in and help us understand the complexity of molecular and chemical interactions. This in turn would enable us to discover new medicines without the need for costly and risky real-life testing, new materials with useful properties to tackle urgent challenges such as climate change and new ways of producing enough food for the world's growing population. Any business that relies on big data analysis or hopes to exploit machine learning could benefit. 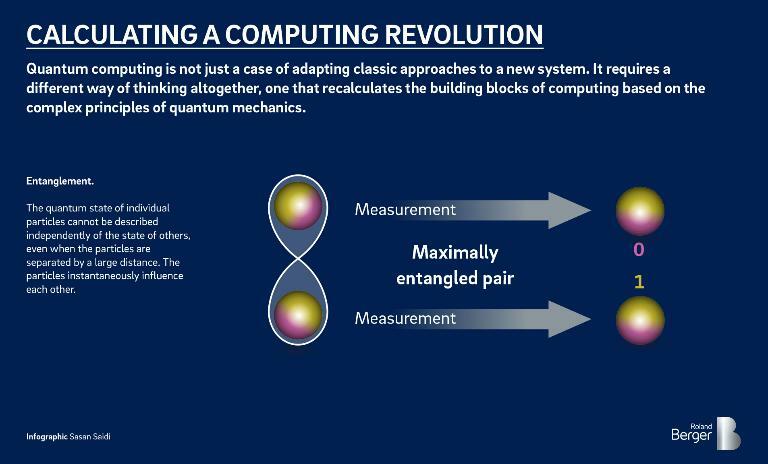 Quantum computing has reached an inflection point, according to IBM's Annunziata. "Modest-sized, approximate quantum computers now exist in the real world and the next generation of these devices may be too big to simulate on a classical computer. A quantum computer which is too big to classically simulate has an inherent computational advantage of sorts," he says. The "quantum advantage" – the point where a quantum computer can perform a practical function that surpasses the capability of a classical computer – is what IBM is seeking to achieve. To do so will require a machine with more qubits than the current machines – somewhere between 50 and 100 qubits or more. One long-standing obstacle is "noise," meaning anything that can interfere with the qubit's stability. That is why they have to be kept at near absolute zero and isolated from all vibrations. Any disturbance can cause the qubits to "decohere," or collapse out of superposition and stop working, causing errors in the calculations. Another challenge is the short coherence time of qubits, meaning the time a qubit is able to process a request before collapsing out of superposition. IBM says that the coherence times of their qubits lead the field with an average 90 microseconds. This might not sound like very long, but it is already enough to carry out computations. Nevertheless, there is room for improvement. "In order to use a quantum computer to solve the problems we're interested in, the qubits have to be protected from noise, and the effect of errors inherent in their operation must be suppressed," explains Annunziata. "Can we achieve these goals without incurring large overheads such as those required for fault-tolerant quantum computation? These are the central challenges." Building expectations: It remains to be seen if quantum machines like the D-Wave system pictured here will live up to the hype. Many of the leading companies working on these challenges are technology giants like IBM. 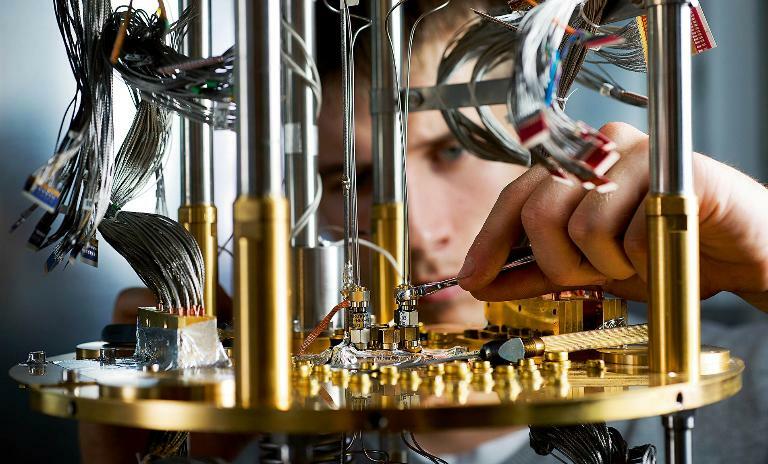 Microsoft has been working on developing a programming language for quantum computing. Google is working with NASA on applying quantum computing to artificial intelligence and machine learning. In China, the search company Baidu has invested $10 billion in a research center. One of the first quantum computers to be available for real world applications was the D-Wave, created by a company in Vancouver, Canada. There are now growing numbers of startups, too. One of these is Rigetti Computing in California, which offers general-purpose cloud-based quantum computers and a full-stack software development toolkit. "We still need to do a lot of engineering to make them robust, cost efficient devices. It's a young field ... "
The Chinese government is showing particular interest in the emerging field of quantum cryptography, which is drawing attention from security experts around the world. The challenge – or threat – is that quantum computers will be fast enough to crack encryption codes. This worry has spurred on research into quantum-resistant cryptography to enable hack-proof communications via a quantum internet. In China, dedicated quantum communication channels via optical fibers have been laid between Shanghai and Beijing and, alongside researchers in Austria, they recently succeeded in using a satellite to carry out the first quantum video communication. Meanwhile the European Union has announced it will invest approximately $1.2 billion over the next 10 years into research in quantum applications in the areas of computation, communication, simulation and sensing. This last aspect is overlooked by many, according to Max Riedel, part of the team preparing the EU flagship program, yet it is furthest in terms of application. 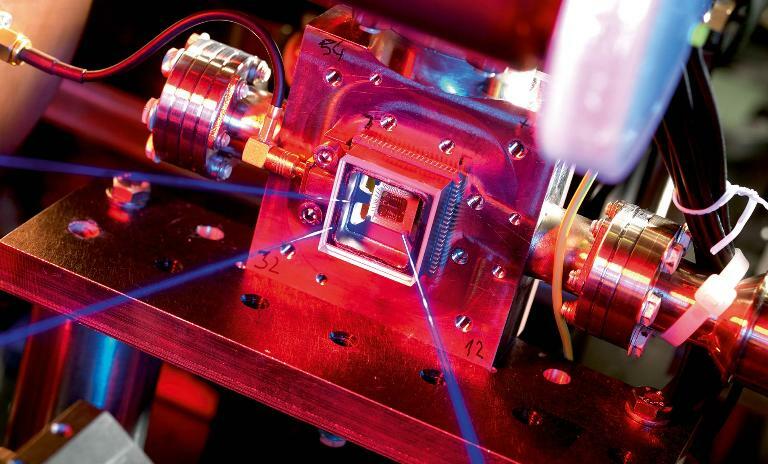 "Muquans, a French startup, has developed precision quantum sensors to measure absolute gravity – the first commercial gravimeter of its kind. It can be used in oil and gas exploration, for example, to search for cavities underground," he says. The first really useful machines are clearly a few years away – but how many years? "It's a very interesting time because we are transitioning from research to the commercialization phase," says Doug Finke, managing editor of "The Quantum Computing Report". "For many years quantum computing was just an academic exercise – many even doubted it would ever work because of its fragility." Finke believes that within the next two years we will see a demonstration of the technology on a commercially useful problem that could not have been solved classically. Will quantum one day replace classical computers? That seems unlikely. "In order to provide the necessary shielding of light, heat, magnetic waves, electromechanical emissions and anything else which might cause a qubit to collapse, quantum computers will always be large and bulky," says Finke. So we won't use quantum computers to send email or browse the web. They will be used behind the scenes. 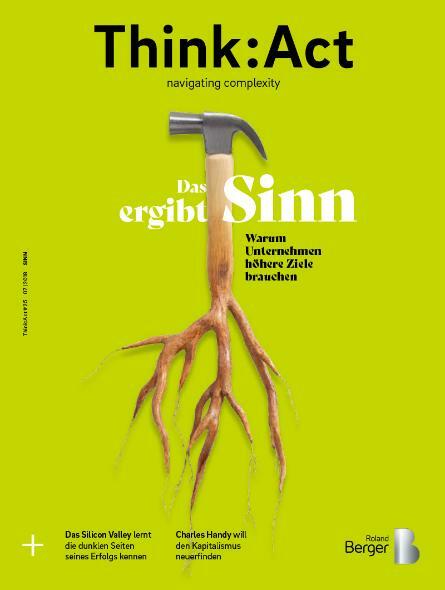 Will they upend business models? Finke thinks it's unlikely. "But businesses in various sectors will want to leverage the technology to create new products and services or calculate better optimizations in ways that were previously not possible," he says. Finke lists machine learning, computational chemistry, financial portfolio optimization and logistics as some of the most promising applications. "We still need to do a lot of engineering to make them robust, cost efficient devices," says Riedel. "It's a young field – the first useful quantum algorithm was discovered in 1994. 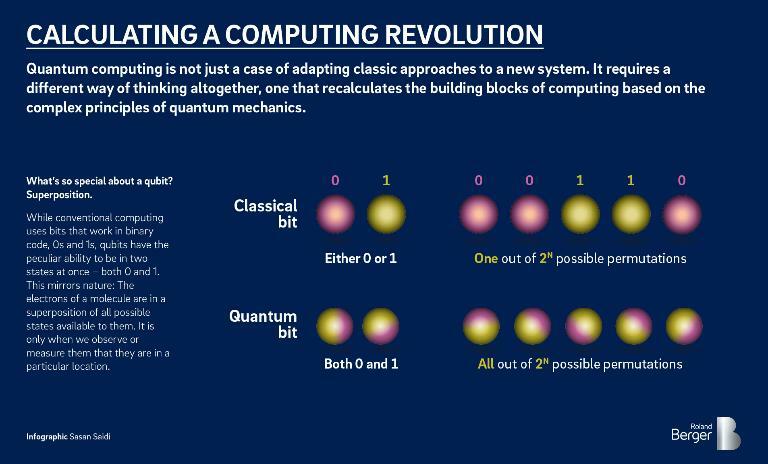 Compared with the development of classical computing, quantum computing is in the 1950s or 1960s when the machines filled a whole room. But the next phase of development will happen quickly." For many who have been involved in the field for decades, their main worry is that expectations will be driven too high. "When the buzz dies down, people will see that it's a promising technology," says Riedel. "What we need now is to connect the people with the problems with the people with the solution."